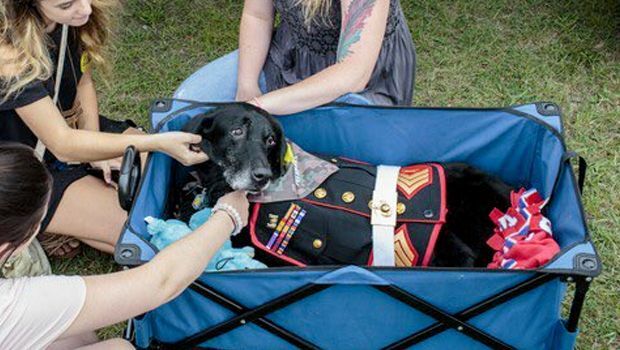 Cena, a 10-year-old black Labrador, was honored by hundreds of people in Muskegon, Michigan after passing away from terminal cancer. The hero marine dog served three tours in Afghanistan as a bomb-sniffing dog, forming a deep bond with troops — particularly his partner, Lance Cpl. Jeff DeYoung. DeYoung and Cena formed their partnership during the six months that Cena served in 2009 and 2010. After retiring, DeYoung adopted Cena, calling the pup his “brother.” During their time serving together, DeYoung saved Cena’s life. He threw his body over Cena while under heavy fire from the Taliban. Cena returned the favor by keeping DeYoung warm during cold nights, and providing him love and comfort after DeYoung lost seven friends in the span of just three weeks. But after retirement, Cena didn’t stop helping his best friend. “This dog, this brother of mine, has sat with me through a divorce, through homelessness, through missed jobs, my PTSD strikes, and waking up in my bathtub crying,” DeYoung said at a Veterans Day ceremony in 2015. Cena, who retired in 2014, was diagnosed with bone cancer and was in a tremendous amount of pain. Knowing that he needed to be euthanized, DeYoung wanted to give Cena a proper goodbye, complete with a ride in a Jeep — one of his favorite things. The veteran didn’t know that the community response would be so big. The community responded. Members of the U.S. Marine Corps League, Michigan State Police, Muskegon County Sheriff’s Office, Muskegon City Police, Muskegon Fire Department, and officials from other departments came to celebrate Cena’s life and service. The service members gave Cena a final three-volley salute, complete with “Taps” playing. A chaplain also attended, leading the crowd in prayer. “Lord, it is with heavy hearts that we are sending another marine to you today,” said chaplain Wesley Spyke. SHARE this story if you believe that all service dogs deserve to be treated like Cena. Editor’s Note: This article was first published on July 28, 2017.